Pumpkin spice season is here! 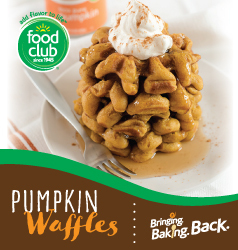 Enjoy these warm spiced waffles perfectly paired with a crisp fall morning. Heat waffle iron to medium heat. In a large bowl mix together oil, sugar, brown sugar, pumpkin, egg yolks and milk until smooth. Add pumpkin pie spice and vanilla. Set aside. In a small bowl mix together flour, baking powder and salt. Slowly add the flour mixture to pumpkin mixture until combined. Set aside. In another small bowl whisk together two egg whites until white, fluffy and soft peaks form. Gently fold egg whites into batter. Place 3/4-1 cup batter on waffle iron. Cook for 3 minutes. Enjoy with whipped cream, syrup and butter.